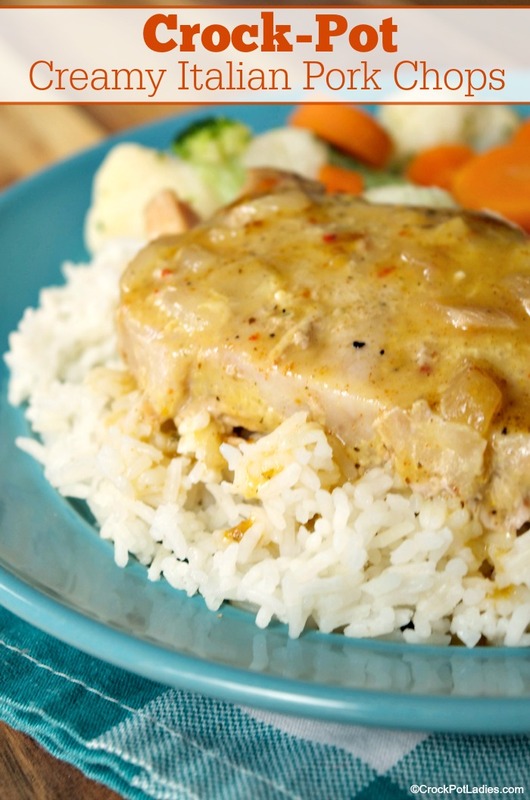 Crock-Pot Creamy Italian Pork Chops is an extremely easy recipe to put together. 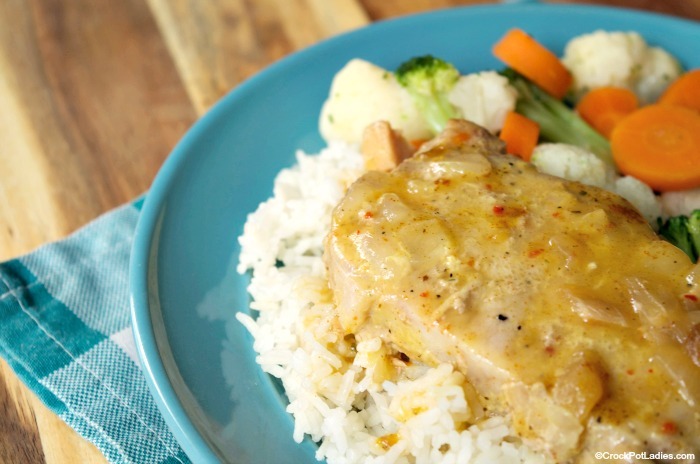 You only need 5 ingredients for the this delicious slow cooker recipe! I made this recipe for a nice Sunday dinner and served it with a large selection of side dishes. I got the pork chops into the slow cooker earlier in the day (the hardest part is cutting the onion…seriously…EASY!). 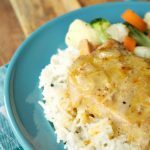 The Italian dressing mix gives this recipe a nice tangy taste and the cream of chicken soup helps to keep the pork chops moist and tender. Now…if you balk at using “cream of” soups that is OK. You can make your own “cream of anything soup mix” that works just great in this recipe and any recipe that calls for a can or two of creamed soups. We get it…not everyone likes to use this ingredient. Us three ladies however are cool with using it since it adds creaminess and convenience to our recipes. For side dishes to serve this with I made a large pot of mashed potatoes, some steamed veggies (fresh zucchini, squash and green beans) and baked up some rolls to make this a complete dinner. Reason number 50148 I love my slow cooker! 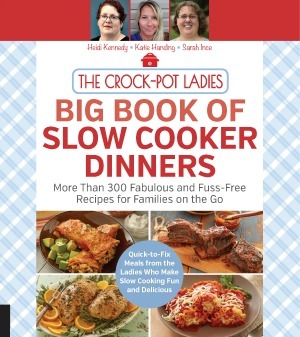 Line a 6 quart or larger crock-pot with a crock-pot liner OR spray with non-stick cooking spray to make clean up easier. Place pork chops in the bottom of the slow cooker and cover with the onions. In a small bow mix together the Italian dressing seasoning mix and the cream of chicken soup. Pour the soup mixture over the pork chops and onions in the slow cooker and sprinkle with a couple of pinches of the paprika all over the top. Cover and cook on LOW for 6 hour. This is a great recipe. I figured out the different types of Weight Watcher points. looking for low sodium recipes.